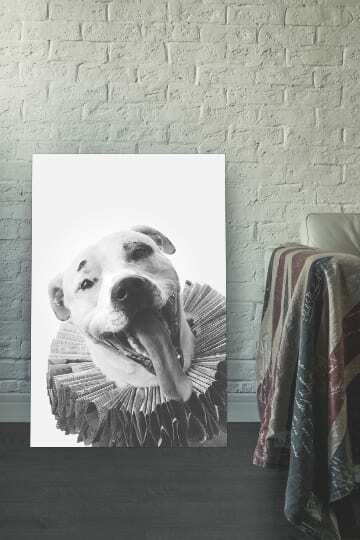 Photo Art for Dog Lovers. No Cats. No People. Just Creative Dog Portraits. A Dogs Only Photo Studio. No Cats. No People. 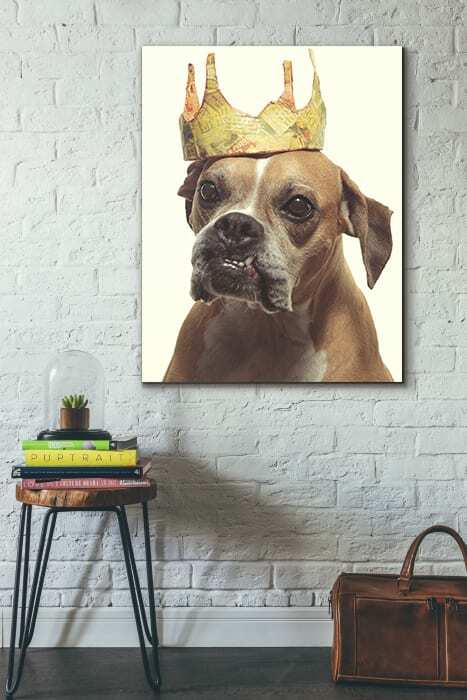 Just Creative Dog Portraits. YOU'LL CHERISH FOR A LIFETIME. A Puptrait is more than a photoshoot with a dog. By scheduling a Puptrait session you are taking the first step towards commissioning a creative one-of-a-kind piece of photographic art. Puptrait studio sessions are unrushed. Our concepts are stunningly creative and our compositions are meticulous. Through careful in-camera cropping and masterful lighting we focus on only the most resonating features of our canine subjects. Engaging and communicating with dogs on their terms, we are able to move beyond simply documenting appearances and capture more genuine expressions and those remarkable, yet intangible hallmark traits that define a dog's unique personality. 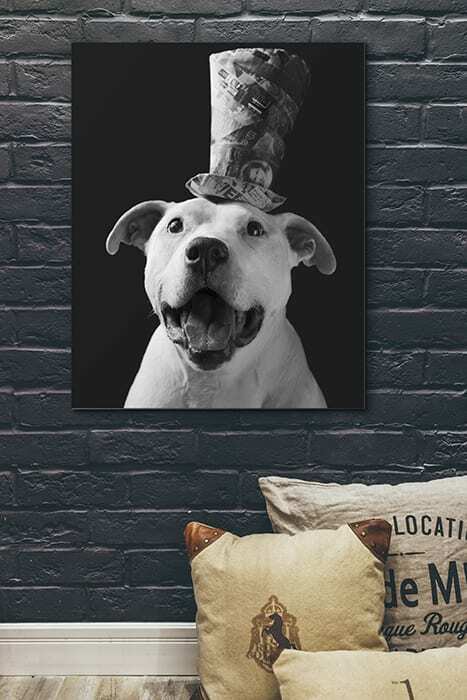 While undoubtedly more difficult and time intensive than other more common or less refined methods, it is our uncompromised approach to pet photography that allows our studio to consistently produce the stunning large format art prints that any true dog lover will cherish for a lifetime. Photographing dogs isn't just something we do - it's all we do. We don't photograph weddings, people or work with other pets. We are full-time professional dog portrait artists. Our Baltimore studio location is used exclusively to photograph dogs and pet products. Our studio space is shed friendly, poop conscious and reactive resistant. Making it a happy and safe place for dogs of all ages, sizes, temperaments, and training levels. Our studio's collection of photo gear, lighting equipment and seamless backgrounds were assembled singularly for the purpose of photographing dogs. In fact, many of the reflectors and light modifiers that we use on a day-to-day basis were designed and fabricated in-house by our staff, specifically tailored to optimally capture fur and snout details in our canine subjects. Patience is the key to working with dogs. Dogs require time to relax, open up in front of the camera and achieve their natural (more) calm state. We find most sessions take roughly an hour and a half to complete. But it's not unusual for some dogs to require more time, and in those instances, we'll stay and work with your pet for as long as we need to for no additional charge. The Puptrait Studio is the only place you'll find our signature Paper Hat collection. Every Paper Hat is an original creation, painstakingly made by hand by the Puptrait Studio founder and lead photographer, J.B. Shepard. 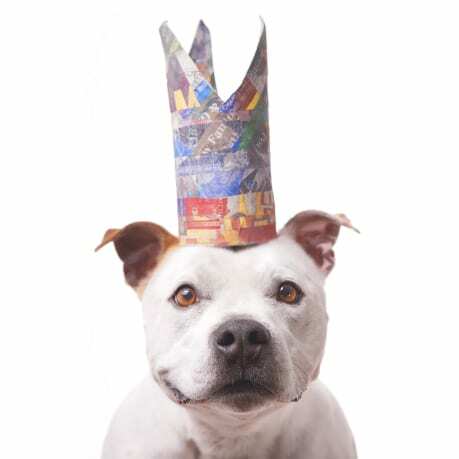 Never dyed or painted, Paper Hats achieve their unique geometric patterning and coloration from careful sorting and placement of varying tints, hues and shapes of newsprint clippings ensuring a truly unique pet portrait experience. We understand how important sharing your new photos on Instagram and Facebook can be. Which is why all Puptrait clients receive mobile friendly web ready sized digital copies of the highlights from their session. Our dog friendly photo studio is located in Baltimore, Maryland within the neighborhood of Hampden. Hampden is one of the more dog friendly and safer neighborhoods in Baltimore, located conveniently just off the Jones Falls Expressway (i-83). Hampden features a number of great independently owned shops, restaurants, microbreweries, bars and coffeeshops - including several within walking distance of our studio that are dog friendly. Don't feel like making the trip to Baltimore with your dog? No problem. We're happy to come to you! We regularly shoot in homes and on locations throughout all of Maryland, Northern Virginia, Washington D.C., and Delaware. We are available to shoot 7 days a week, including during weekends and most holidays, from 12PM until 10 PM. To help minimize distractions and better accommodate our more skittish, reactive and messier guests our studio hours are by appointment only. To schedule a pet portrait session or to view studio availability please use our online scheduling app located below. We have worked with many dogs with mobility and other health-related issues, and have become quite adept at structuring sessions that minimize potential pain points and stress triggers. We offer priority booking to dogs sick with potentially terminal illnesses and in instances where a pup is scheduled for treatments that may alter their appearance, such as chemo or radiation therapy. When we say that a Puptrait is more than a photoshoot, we mean it. Sessions are just one step in our commission process. Which is why unlike a lot of other photo studios, we only charge most of our dog portrait clients just for prints. As long as you meet your minimum post shoot print commitment and your order is placed within 30 days of your session date you won't be charged any studio fees, session fees, dog portrait sitting fees - even standard shipping is already included in the cost of pet photography prints. All private Puptrait sessions are sitting fee FREE with minimum print order commitment.